Domain privacy is a service available from (mt) Media Temple which protects your personal contact information from being displayed publicly on the domain's WHOIS listing. From your Account Center, you can purchase and enable this feature. Watch this video to learn how to enable domain privacy. Click on the Domains button on the top menu bar. Select your domain from the Domains drop-down, or click Show All to select from a complete list. In your domain's administration panel, look for the Domain Tools section. The Domain Tools menu will only be available if your domain is registered through (mt) Media Temple. If you do not see this, double-check where your domain is registered. Domain Privacy can only be enabled through your domainâ€™s registrar. 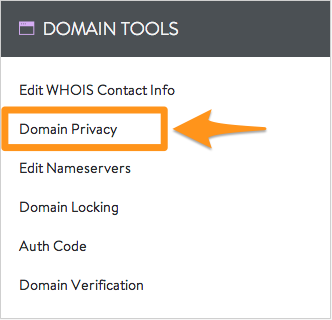 If you have already purchased Domain Privacy, the Domain Privacy option will be available to you. 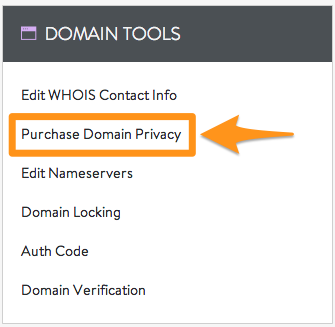 If not, select Purchase Domain Privacy to be taken to the ordering screen. Click the Save button at the bottom to confirm your selection. It can sometimes take 24 to 48 hours for the domain privacy change to take effect. Simply disabling domain privacy will not end any subscription you have purchased or upcoming renewals. To close this add-on service, you will need to submit a Request to Close through the Billing tab of the Account Center.